So my passion for the underdog was my downfall again, but it could have been all very different if Janko Tipsarevic hadn’t retired through injury, undoing my predictions once more. I was hoping for more than just the Nos. 1 through 4 seeds to reach a rather predictable semi-final match up. But I guess they are the top four in the world for a reason. Andy Murray will face Roger Federer in a semi final for the umpteenth time, and Novak Djokovic will have to squeeze past David Ferrer to reach the Australian Open final for a fourth time. Novak Djokovic faced a tough challenge against the No. 5 seed Tomas Berdych in the last round, and an even tougher challenge against Pole Stanislas Wawrinka in the round before that. But Djokovic showed steel and strength to overcome both opposition, the latter mentioned being one of the best matches of the tournament so far, and should, I say should, continue his dominance in the Australian Open over David Ferrer. The Spaniard has never reached a Grand Slam final, and I think he will have to wait a little longer to do so. This is a gut-wrenching decision, as betting against Roger Federer is always difficult, because you write the Fed-Express off at your peril. But after Murray’s performance in the Olympics, US Open and tournaments leading up to this, he is still improving with every match, rather than flaking out after his first ever Grand Slam victory like I thought he might. Having not dropped a set (albeit against average opposition compared to whom the other three semi-finalists have faced), Murray looks like a Flying Scotsman on course for the final. Sorry Roger, but don’t worry, you’re still my favorite. 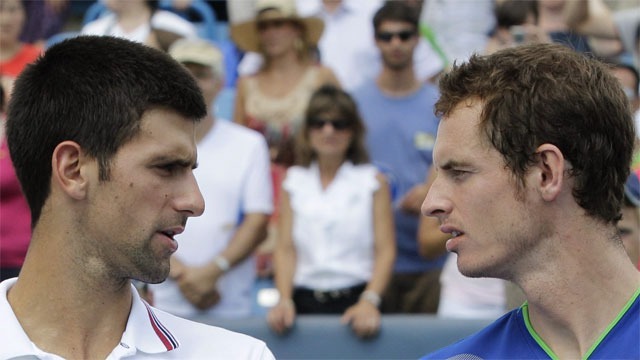 I know, I am backtracking on my original prediction of a Djokovic vs. Federer final, but I couldn’t overlook Murray’s impressive performances. A rematch of the US Open final looks the most likely, and will hopefully produce a similar fight to their last Grand Slam encounter in September. I honestly don’t know who is going to win. Current form suggests Murray. Current ranking suggests Djokovic. Ability? It could go either way. If I had to call one person to win, it would be Djokovic. No… it would be Murray. Actually, no, it’s going to be Djokovic. Definitely.